What I’ve learned from my ten years of volunteering in school computer labs: The MOST important grade for increasing efficiency and reading skills in school is FIRST GRADE. And first graders can definitely learn to touch-type. No matter what the obstacles (and there were many) it’s important to encourage each kid to really learn to touch type. It takes practice, but with Read, Write & Type the practice is fun! Kids have such a wide variation in how their brains are wired, there’s a huge difference in practice time to learn the sound-to-keystroke (letter) habit. But the practice is worth it, because they’re learning the skills they need for reading and writing at the same time. And if they master the keyboard they are much more efficient and confident in their writing all through the rest of their school years. Teachers are waking up to the importance of typing skills for using just about any software program. But mostly they start too late–after hunt-and-peck habits have settled in. However, thousands of children are learning to type IN FIRST GRADE as they learn basic phonics skills with Read,Write & Type. 8 free lessons at www.talkingfingers.com. Your child will only learn to read and write once! Don’t miss it! Sometimes it happens in the space of a few short months. You can play a vital role, and it may be one of the most significant things you and your child ever do together. Reading and writing are the most important skills children learn for success and happiness in school and beyond. Learning to read and write is a staggering accomplishment, much more difficult than learning to speak and to understand speech. Becoming literate is one of the most essential major learning experiences of modern life. It is a valuable tool for personal expression, and a doorway to the written wisdom of the brightest and most interesting members of the human tribe since history began. Hey Mom! I Spell Better When I Type! We were on port tack in the middle of the Atlantic, moving fairly smoothly toward landfall in the Azores. 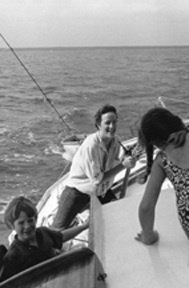 Our family of four was on the way from New Orleans to West Africa in our 31 foot sloop. After some rough days, it was a relief to keep my food down and enjoy being at the helm. Melissa, 11, was reading in the hammock, and Matthew, 13, was wedged in the companionway typing his log. I had been encouraging him to use our little portable typewriter, because he was left-handed and had considerable difficulty writing legibly. I was sympathetic because I could remember my own elementary school tears, trying to write as a lefthander. I remember forcing myself to turn the paper to the right and hold my hand under the line so I wouldn’t smudge the ink. Matthew used the left-handed “inverted” hand posture when he wrote, cocking his wrist and using the larger muscles of his wrist and arm rather than the fine motor coordination of his fingers. The letters ran together as if his mind was racing ahead of his fingers. He missed details, like dotting i’s and crossing t’s. He didn’t notice his spelling errors and could hardly read what he wrote. A recent article in Education Week bemoans the fact that students are using cursive less and less, and in some cases, do not know how to read cursive. They still seem to do pretty well at printing, and reading what someone else has printed. Interesting! 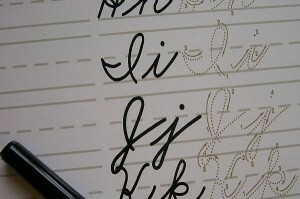 My daughter is a calligrapher and loves forming letters in different “hands”. But those flowing letters may become over the next years more of an art form, rather than an everyday functional way to put words on paper. It’s true that typing on the computer has become an easier way for all of us to write. Should we go back to cursive? The educational goal for writing is for children to be able to express their thoughts in text and to edit and refine those thoughts in order to communicate clearly and effectively. If this process is easier using a word processor—no erasing, no throwing out the paper and starting over—then children will spend more time writing and enjoy it more. 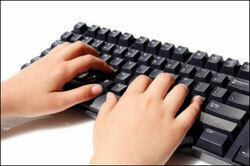 Research has shown that children write longer stories and make more edits and revisions when they use a word processor. Isn’t that what we want to encourage? However they do not write more easily on the computer if they are “hunting and pecking”. They need to learn how to type. So why are we waiting until fifth grade or later to teach children to type, when they can learn it in first grade? It’s actually easier to press keys than to bend their little fingers around a pencil and form letters. Why not help them do both? They could establish a touch-typing habit early, so writing can become as enjoyable as possible. What do you think?